Our friend Gary who helped us move our stored stuff to Florida invited us to take part in the annual tugboat race in Detroit, MI. Gary is friends with the boat owner and he uses this particular tug as a personnel yacht. It turned out that the tug was built in the Netherlands in 1956 for the Dutch Navy. It still had much of the original paperwork and ships labels onboard. When the crew discovered that Anneke was Dutch, she was immediately a very popular person. She spent quite some time translating documents and ship labels for the crew. The owner operates a marine company on Lake Erie and his whole family is involved. There were around 50 people onboard including most of the owner’s family. They went all out with the food and drinks for this 12 hour plus day on the water. We boarded the tug Josephine at the company dock in Toledo at 7:00 Am for the trip to Detroit. The weather was perfect and it was a great day on the water. We passed by many of the waterfront facilities in Toledo and Detroit that I had dealings with during my working life in the Coast Guard and later working in the commercial marine industry. It also brought back many great memories of our sailboat days on Lake Erie. This tugboat race is a fun event but certainly the competitive spirit is strong. As we assembled in the Detroit River for the start of the race, some of the boats, ours included, did some close aboard bombarding of the other competitors with water balloons. I barely avoided water damage to my camera several times during these battles. Finally, the race was ready to start and the competitors lined up abreast of each other for the start. One of the vessels we had the most water balloon exchanges with lined up very near to us. At the gun, we were off with the close aboard tug constantly veering in towards us. Our crew held fast and it was a very exciting personnel battle between our vessels. When you are traveling full out in heavy displacement hulls, there is suction and cushion affect that can cause difficulty with the control of these vessels. Apparently, the other helmsman was not that familiar with this concept and we had two rather robust collisions. It would have been a great time to board with grappling lines and swords, but many of our crew was too busy heaving balloons and enjoying beverages. For myself, I was busy getting lots of pictures, hopefully not for any upcoming admiralty case. After the race, we made a short port call in Port Windsor, Canada. They had a celebration going on as the port was one of the sponsors of the race. We did not have enough time to do any real exploring, but it was a good chance to stretch our legs. The return trip to Toledo was relaxing and filled with even more food served on deck. Thanks to Anneke’s translation services, we have already been invited back for next year! The last two weeks have been filled with arranging to get the things we have had in storage for four years in Ohio to Florida. After arranging for a rental truck and movers at both ends to load and then unload the stuff, we pointed the motorhome north. Gary, a very dear friend, volunteered to drive the truck to Florida following the motorhome. 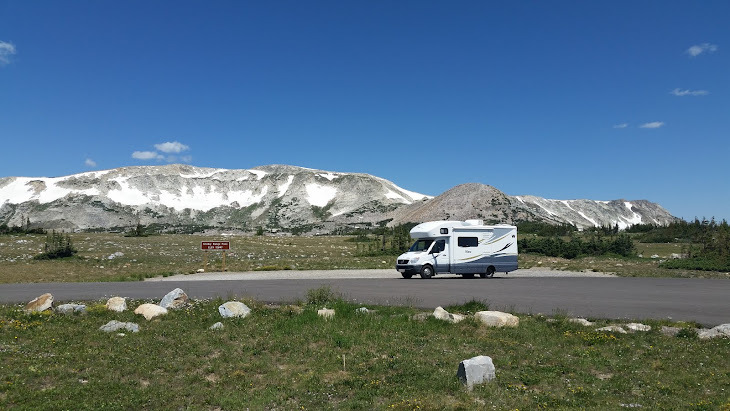 On the way north, we realized that we would be in Ohio while our Winnebago Club was having a campout in Bowling Green, so we spent the weekend catching up with our fellow club members. As always, it was lots of fun. Bowling Green is a college town where Katie and Heather received their bachelor degrees. We have fondness for this picturesque town with lovely homes. Perhaps, this is because of all the money I left thereJ We braved the 95 degree temperatures and walked some of the streets looking at the homes and chatting with some of the natives. In Toledo, we picked up the truck and met the movers at the storage unit shortly afterward. It was fairly relaxing watching the movers load the truck and I was so glad I was not trying to do it ourselves. Two hours later, they were done and we were on our way south. We made it to Florida in three days, with the three of us staying in the motorhome. It was tight but manageable. In Florida, the movers arrived the morning after we got home and quickly unloaded the truck. The round trip was much smoother than I could have hoped and none of my worst case scenarios played out. We spent a few days relaxing and opening boxes to be surprised at all the stuff we had not thought about in the last four years. So far, we have not found a lot things we should have thrown out. I guess that means that we did not change our minds much about what to keep. Then it was time to get in the motorhome again to drive Gary home to Ohio. Yup, that is three trips in quick succession. On the trip north this time, we changed routes so we could visit our grandson and family in GA. We had not seen them since last fall. We made an overnight stop, taking advantage of our new reduced sized RV and dry camped in the driveway. It was a great but short visit. After three weeks of house organizing and furniture hunting, we are back on the road. I have grown weary of watching the house next door being built. It is like watching mold grow. What a painful process. Of course, this trip is mostly related to, you guessed it, the house. We are heading to Toledo, Ohio to pick up the stuff we have had in storage for four years. We have completed the first day and feel like we may be taking after Paul and Marti’s roadrunner practices with over four hundred miles traveled today. There were very few of those in the last five years. We may be going for a record tomorrow, so that we can join friends having a rally in Bowling Green, Ohio. I will have to see if my lead foot holds up. I am glad to say that the first day on a long run with the new motorhome was blissfully uneventful. I was able to park this one in a car parking spot at a locally famous BBQ place, so we would not have to cook after a long day on the road. We are staying at the Texas T campground in Cornersville, TN. The great thing is they have WI-FI for one dollar a night or 10 a month! A very nice place for an overnight. From campground entrance to back on the interstate is less than two minutes. Here is hoping that tomorrow goes as smoothly.